Happy October! It’s my favorite month of year! Fall leaves, cooler weather, Halloween, and all sorts of fun treats, soups and comfort foods! Even though Halloween is one of my favorite holidays, I don’t crazy with decorations and treats. I like to keep things pretty simple. I think most moms with small kids can agree that you don’t have a ton of time to make fancy Halloween treats for your child’s halloween parties. I love cute and festive treats–as long as they are simple! Some great examples of impressive but EASY halloween treats include these Chocolate Chip Spider Cookies and Pumpkin Cupcakes with Cinnamon Cream Cheese Frosting. I’ve seen several cute candy witch hats lately, like these. But I wanted to make a halloween cupcake with them because cupcakes are one of my favorite treats to bring to Halloween parties. 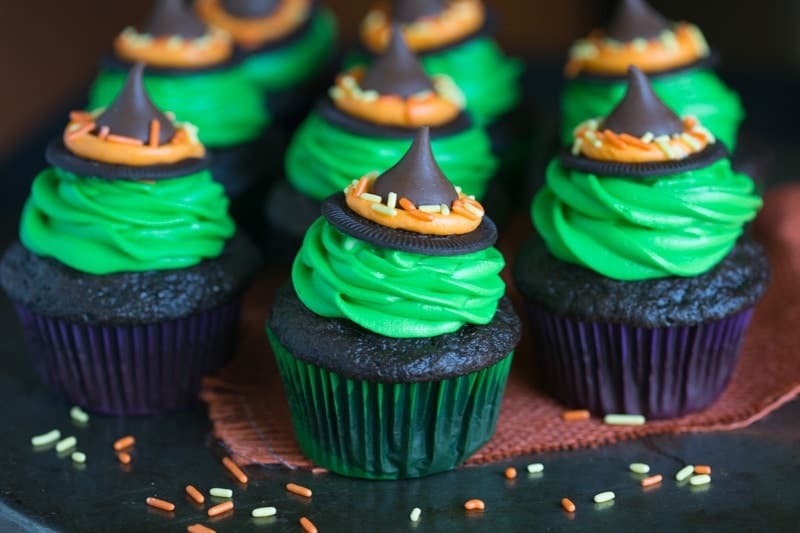 These Witch Hat Cupcakes are fun and festive, but super easy too. My kids love to help make the Oreo witches hats and add the sprinkles. 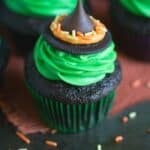 Witch Hat Cupcakes that take just 5 ingredients to make! 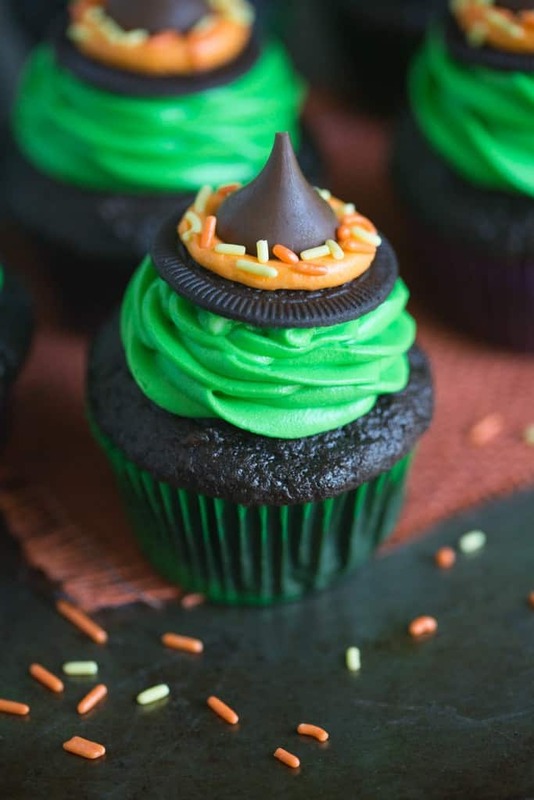 You kids will love helping you make these fun and easy Halloween cupcakes! After making the cream cheese frosting, separate 1/2 cup of the frosting into a separate bowl. Color the larger amount of frosting green, and color the smaller amount of frosting orange. Gently split the Oreo in half. Place a very small spoonful of orange frosting in the center of the top of the Oreo cookie. Place a Hershey's kiss on top and press down. Add some sprinkles. Set aside. Pipe the green frosting into the center of the cupcake (don't go all the way out to the edges!) and wind it gently up into a few layers. How did you get that neon green color for the frosting? Which brand coloring did you use? My cream cheese icing is so runny! I followed the recipe exactly, and even added more powdered sugar to try to stiffen it up. Any tips on how to get it to hold it’s shape? Refrigerate for a while? Add more sugar? Help please! Yes, just add more powdered sugar to stiffen it up. Refrigerating will help as well. Do you make your own cupcakes or use a boxed chocolate cake mix. If you make them from scratch where is your recipe and also your cream cheese icing recipe. Thanks Margo..